Thirty years ago, scientists reported a hole in the ozone layer "the size of North America." The culprits were man-made chemicals called CFCs, which were prevalent in billions of dollars worth of refrigeration, air conditioning and other products that had revolutionized America's way of life. With doctors forecasting skyrocketing cancer rates if changes weren't made, the stakes were literally "life as we know it." Yet companies remained bitterly opposed to changing their products. Politicians were slow to act. Like with today's CO2 emissions, an invisible compound was threatening the Earth's life-support systems, but a solution seemed beyond reach. Eerily reminiscent of today's energy and climate crisis, Shattered Sky tells the story of how America led the world in solving the biggest environmental crisis ever seen. Those interviewed include William Becker, Richard Benedick, Eileen Claussen, David Doniger, Daniel Dudek, Kevin Fay, Ross Gelbspan, Jeff Goodell, Hunter Lovins, Mario Molina, Bruce Niles, Michael Oppenheimer, Shari Road, William Reilly, James Rogers, F. Sherwood Rowland, George Shultz, Susan Solomon, Gus Speth, General Gordon Sullivan (Ret'd), Lee Thomas and Robert Watson. "This film reminds us of a time not long ago when we put politics aside and led the world to solve a global environmental challenge. We must do this again." "A highly compelling synthesis of the complex interplay between policy, business, science and advertising focusing on the production of CFCs and coal and their environmental impacts. Attempts to confuse the US public and sideline the environmental and economic impacts of stratospheric ozone depletion backfired and the US took a leading role in the international legislation that led to the Montreal Protocol ban on stratospheric ozone destroying CFCs. Shattered Sky is a call to action for the US to come forward again, today, as a leading voice at local to international scales in the reduction of greenhouse gases." "Watch this film. It shows we've been there before, and come out the other side with a clear victory-for both business and the environment." "Shattered Sky has stunning photography, top-notch interviews, and a balanced, even-handed presentation. It calls the US to political leadership on climate change by showing how--decades ago---President Reagan and the US led both reluctant European nations and affected corporations to ban CFCs and protect the ozone layer. A hopeful and uplifting film, it asks the US and industry to 'do it again,' to lead the world to action on climate change. This is a great film for everyone, especially high-school and older students in environment-related, government, policy, and science classes." "Shattered Sky might better be titled Shattered Leadership for it cogently asks why is America not leading the climate negotiations as it led a quarter century ago when the ozone hole appeared. Ronald Reagan was not an environmentalist, but, as this film beautifully documents, he and his administration took the warnings of environmental scientists seriously. Let's lead again." "Shattered Sky provides a valuable history of the United States' leading role in finding a bipartisan, worldwide solution to the hole in the ozone layer. 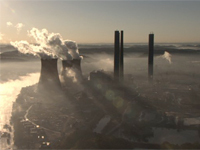 The film also asks, 'Why can't we do the same for the climate change problem?'" "A positive perspective, and very accurate and scientifically correct. The connection between the world's energy problem and the climate problem was excellently made, and the historical treatment of the ozone problem was also excellent. We were able to solve a very large, international environmental problem when everyone (individuals, governments and business) got on board. Many of my students feel hopeless when they come to understand the climate problem, and don't see a way out. But as the film highlights, we have successfully tackled problems of this magnitude before. The lessons learned from solving the ozone problem are clear: there IS something that can be done about climate change, and we CAN start to fix the problem." "Shattered Sky tells a dramatic story of humans using science to understand and, ultimately, to mitigate changes to the environment...[The film is] extremely instructive to our society's current struggle to mitigate climate change without disrupting economic development. This fair and balanced account should be shown to the students and politicians. They need to see the scientists and industrial leaders who, together, stress that action must be taken to address climate change, particularly in the area of energy derived from fossil fuels. Together, these voices clearly state that acting now rather than waiting is a cost savings." "When I was Secretary of State under President Ronald Reagan, the United States played a leading role in addressing a critical global environmental challenge--preserving the Earth's ozone layer, which protects us from the sun's harmful radiation. I look back at the US leadership in securing [the Montreal Protocol] as one of my proudest accomplishments as Secretary of State. A new documentary film, Shattered Sky, tells this story. It also explores parallels with the current challenges we face in addressing global climate change and developing clean and secure energy supplies for the future. I urge you to watch this film. It shows what we can do when we actively work together to make a difference." "Showcasing a film such as this one is very timely. Shattered Sky is not polemical, but provides both historical perspective and context for many who may have completely forgotten how these kinds of enormous issues--with huge scientific, commercial and political stakes--could actually come to resolution." "The timing could not be better for Shattered Sky. I am convinced that people of all stripes will be inspired by Shattered Sky to put aside short-term politics on climate change and consider the legacy we leave." "Shattered Sky reminds us that global solutions are possible when we work together and the United States leads. The historic achievement on ozone retold in this film--the collective efforts of NRDC and others in the courts, Congress, and public square--was a triumph of bipartisanship and global cooperation. This film gives reason for hope that we can overcome our differences and win lasting solutions to the climate and energy challenges of today." "We're living through very uncertain times, but Shattered Sky--and the powerful American success story it tells--reminds us that we can overcome our biggest energy and climate challenges if we confront them with resolve, confidence, and a sense of optimism." "Unlike many environmental documentaries...Shattered Sky does not leave one feeling helpless and doomed, but instead is full of hope. For if America was once able to forget its political differences and fight together to counter an environmental disaster such as the depletion of the ozone layer, it can certainly rise to the occasion once more." "Eye-opening...Not only must citizens make changes in their personal lives, but governments must take a proactive leadership position in addressing issues that could alter the world's environment forever. We can act now when the price to pay is monetary and inconvenience. Or, we can foolishly wait until things become critical and chaotic and can't be fixed with money...Films like Shattered Sky offer a glimpse of how we can all work together to address another impending environmental crisis--climate change." "Shattered Sky is enlightening, educational, and also thought-provoking in its comparisons between the ozone crisis and modern day problems such as the deleterious side effects of America's modern-day dependence on coal for 50% of its electricity...Highly recommended."